One of the most important aspects of tortoise care is proper diet. These guidelines will help ensure the health and longevity of your tortoise. Desert tortoises are completely herbivorous, eating on a wide variety of plants in the wild. Likewise, in captivity, the best diet is one that provides a variety of foods to meet its nutritional needs. Ideally a captive tortoise should be allowed to graze on grasses, leafy plants and flowers. Grass can contribute a significant portion to your tortoise’s diet if you establish a patch large enough for it to browse (at least 6 feet by 6 feet. Other plants that you can establish in your yard that provide a varied diet include native grasses, dichondra, filaree (heronbill), spurge, dandelion, hibiscus, wild grape, mulberry and wildflowers such as globemallow. Your tortoise will enjoy the leaves, stems, and flowers of these plants. Native plant seeds can be purchased at the Arizona Native Plant Society website or by inquiring about native plants at a local nursery. Plants meant for your tortoise to graze on must be planted inside the enclosure in sufficient quantity to allow daily grazing. In general, commercial produce is less nutritious than native plants for tortoises due to higher water and lower fiber content. However, produce can serve as a supplemental food source if you are unable to establish plants within the enclosure. Dark greens rich in minerals and vitamins such as collard, kale, mustard greens, turnip greens, cilantro and parsley can be offered as a short-term alternative or as a supplement to grasses. When dark greens and acceptable produce are offered, they should be clean, fresh, and chopped into pieces small enough for the tortoise to eat. Iceberg lettuce provides little nutrition and should be avoided entirely. Foods should be served on a dish or feeding platform to prevent ingestion of gravel or sand, which can cause gastrointestinal irritation or impaction. Many tortoises will eat foods that are not part of a healthy diet. They may even appear completely healthy for years on a poor diet. In reality, poor diets, such as those that are rich in sugars (including fruits), protein or animal fats will impair organ function and may result in the eventual death of your tortoise. Do not feed your tortoise dog or cat food, monkey chow or any food that contains more than 15 percent protein. These will cause liver and kidney damage, as well as deformed shell growth. Do not feed tortoises frozen vegetables or sodium-rich foods including canned vegetables, dairy products, breads and celery. Please exercise caution to ensure that captive tortoises cannot consume toxic plants such as oleander, chinaberry trees, tree tobacco and toadstools. Fruits, should only be offered as a special treat. Once a month or so you can give your tortoise a small piece of fruit such as a strawberry or one-quarter slice of peeled watermelon. Fruit generally has too much sugar and water to be fed in large amounts and should only be fed in moderation (no more than 10 percent of the diet). Sugar and starch disrupt digestion by changing the type of bacteria that live in the tortoise’s hindgut. Make sure that water is available in the enclosure a few days of the week. Keep the water dish in the same place so the tortoise knows where to find it. Your tortoise will get a lot of its water from its food, so you may not see it drink frequently. 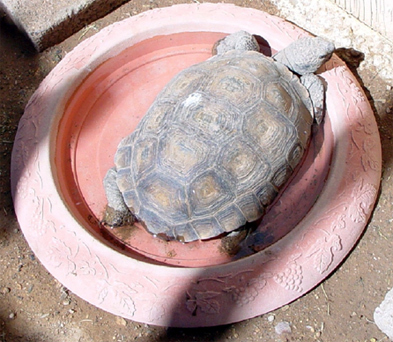 However, tortoises enjoy soaking occasionally so the water dish should be just a few inches deep, and wide enough for the tortoise to sit in. tortoise to soak in, but not too deep that it is in danger of drowning.